3 Different Saxifraga Collections - De website van alpigena! Silver Saxifrag mature plants are sold out. If you want young plants available, but just potted up. The only rule is that we choose the plants for you. So you can not order on name. We collect for you 25 Saxifrages with different form and flowercolor. 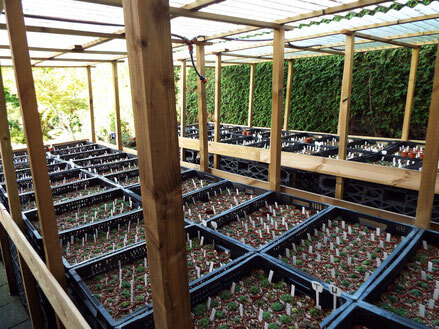 25 different Porophyllum Saxifraga's (Kabschia's) selected by us. Including Post + Packaging; 75,- €uro. Please state beginner or advanced. 25 different Silver Saxifraga's selected by us. Including Post + Packaging 50,-€uro. Please state beginner or advanced. A mix of 25 Kabschia and Silver Saxifraga's selected by us. Including Post + Packaging 60,-€uro. Please state beginner or advanced.